Have you ever been sad when you finished reading a book? That’s how I felt this weekend when I finished reading Lisa Wingate’s amazing new novel, Before We Were Yours. I didn’t want it to be over! I didn’t want to let go of Rill and Avery and the other characters I grew to love and care about so much. Although Wingate’s ending helped a lot—she satisfied my curiosity, and gave closure where needed. But don’t worry, there are no spoilers in this review (I hate when that happens). My other immediate response to the book (other than not wanting it to end) was this: “I wish I had written this book!” Her main character, Rill, is about the same age as Mare, the protagonist in my novel, Cherry Bomb. They are both spunky orphans with big hearts. They both suffer great injustices. And they both have mysterious connections to other characters in the book. 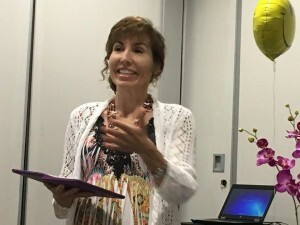 Lisa speaking at the Memphis Library on June 2. I met Lisa at an event at the Memphis Public Library and Information Center on June 2. 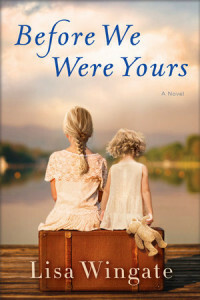 She was invited to speak about Before We Were Yours, a novel based on the Tennessee Children’s Home Society orphanage scandal that happened in Memphis from the 1920s to 1950, when the cruel director, Georgia Tann, kidnapped and sold poor children to wealthy families all over the country. She focuses on one family in particular—the Rills—who live in a shantyboat that often docks along the Mississippi River at Memphis, near Mud Island. This is only a few blocks from where I live, so I was fascinated by her description of the life these “river gypsies” lived so close to my neighborhood, Harbor Town. She conjured up Huck Finn-type stories that drew me into a different time, a time that sounded magical and almost unreal. But reality invades when young Rill and her siblings are kidnapped while their parents are in the hospital—where her mother is giving birth to twins. The story of the horrors they endured at the Memphis branch of the Tennessee Children’s Home in 1939 is intertwined with the life of present day wealthy federal prosecutor, Avery Stafford, in Aiken, South Carolina. Avery happens upon some information that leads her on a search back through her family’s history, and she discovers connections that can either lead to healing or possibly upheaval for herself and her family. In her “Note from the Author” at the end of the book, Lisa explains how much of the story is “true,” and shares some of the avenues she took to research the book. A former journalist, it’s obvious that she’s done her homework. But this book is so much more than history. It’s literary fiction at its finest. Richly drawn characters, vivid settings, compelling dialogue, and smooth transitions are some of the tools she uses to tell this story. As she goes back and forth between 1939 and the present day, she keeps the reader safe, without confusion. Wingate is the bestselling author of more than twenty novels. Her work has won or been nominated for many awards, including the Pat Conroy Southern Book Prize. She lives in southwest Arkansas, but is moving to Texas soon. I look forward to being with her in January at the 2018 Pulpwood Queens Book Club’s annual Girlfriend Weekend in Nacogdoches, Texas, where we will both be presenting authors. Before We Were Yours is one of the best books I’ve ever read. Ever. It’s right up there on top of my all-time favorites list with Pat Conroy’s Prince of Tides. Buy it and read it. You’re welcome.